mom who works | the joys and challenges of being a working mom trying to find "balance"
I’m purging my extensive collection of AUTHENTIC Chanel Le Vernis nail polish – ALL COME WITH BOXES unless specifically noted in the description, and several are very rare/collectible, discontinued limited editions. Please email me at debbahs44(at)gmail.com with BLOG SALE in the subject line. I will then respond to you with an invoice and my PayPal details and hold the polishes you request for 24 hours. First come first served! If you don’t send payment within 24 hours of my confirmation email, they will be released. FREE SHIPPING in the continental US if you buy 3 or more polishes. Otherwise shipping & handling is $6 for 1 or 2 polishes. I will ship within 1 business day of payment receipt. Please review photos carefully for accurate polish level – not all Chanels are fully topped off when new. None of these have been used more than 2x by me but again see the photos for accurate view of level. With some of these I’ve noted the recent value these have sold for (not listed, but actually sold) on eBay as a reference point and have adjusted the prices accordingly based on usage and the fact I want to sell these! All prices are below current market value as I both want to move these to new homes and I’m saving eBay fees by selling direct. Everything listed is sold as is and shown. ALL SALES ARE FINAL. Thanks for looking, and please SHARE this post! I’m now 6 weeks into my Apple Watch love affair and our relationship just keeps deepening. Perhaps most surprising to me, however, as the initial glow wears off and we start to develop a more entwined and symbiotic relationship, is how Apple Pay has really become the Apple Watch’s killer app. As I mentioned previously, I’m usually one to try new things – not early adopter per se but right on the tail end of that mindset. When Apple launched Apple Pay on iPhone, I was all excited to get my cards loaded in and start using it. Unfortunately, the fact that it takes the same effort to root through my purse to find my phone as my wallet (actually my wallet is bigger so it’s easier to find! ), and I never quite figured out how to make it work seamlessly by touching my phone to the credit card terminal, I rarely, if ever, ended up using it in real life. With Watch though, it’s AMAZING! If you’ve been to a Disney park since they launched Magic Bands you’ll know exactly what I mean. You wear the Magic Band on your wrist and it serves as your room key, park ticket, and digital wallet – you just wave the band at the terminal anywhere on property to buy food, gifts, services, everything. With Apple Pay on Apple Watch, its like having a Magic Band for your real (i.e. non- Disney) life. Now, as I’m heading to the checkout line, I don’t need to root through my purse to find ANYTHING. I just quickly double tap the side button on the Watch (the longish button below the digital crown) to open Passbook, and hold my wrist up to the terminal. Payment is seamless, instant and secure. I’ve seen a few cashiers’ mouths drop open when I do this, which always makes for an interesting quick conversation. For security, you do have to load your credit cards on the Watch app separately from the cards on your iPhone (although your other Passbook cards, like frequent buyer cards and coupons will sync to Watch if you have Mirror My iPhone selected in the Passbook app under Watch). You can select your default card on the Passbook app as well (and it can be different than the one on your iPhone). You also should have your Watch set with a passcode if it’s off your wrist if you are planning on loading cards to your Watch. But once that’s done, you are good to go! You too can impress your local cashiers. What do you think? 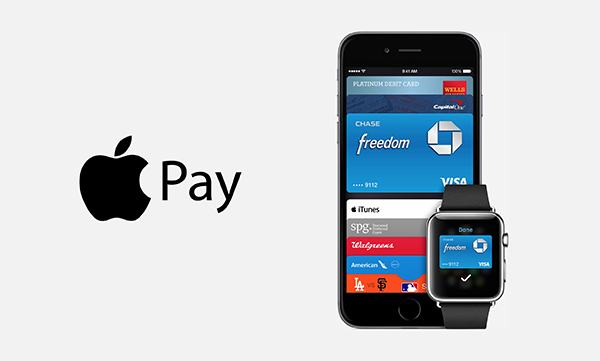 Is Apple Pay the killer app is for Apple Watch? Let me know in the comments! 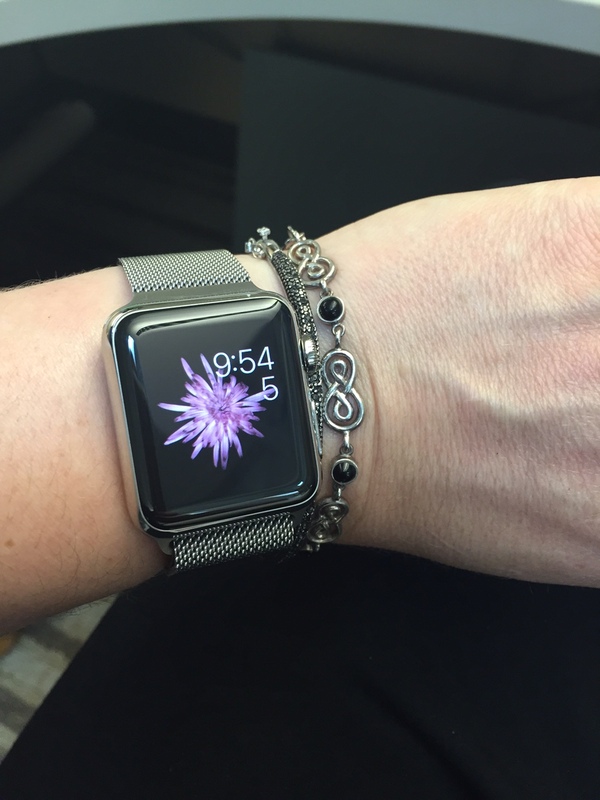 FULL DISCLOSURE – My lovely hubby and daughter got me an Apple Watch for my birthday a few weeks ago, and I LOVE it. I’m not a fashionista, and I’m not a tech guru, just a busy working mom with a slight tilt toward early adoption (not the type of bleeding edge where I will wait in line for hours to be the first to get the latest gadget, but I’m open and willing to try new things). This is not an in-depth review of the Watch, but instead my thoughts about it after using it in the real world for a few weeks. My initial impetus for wanting an Apple Watch in the first place was for the fitness tracking – I have to admit I just hate the look of the typical FitBit wristband that just screams “I’m trying to get in shape” to everyone who sees the black plastic lump on your wrist. I had actually resigned myself to the FitBit One, which I at least could hide somewhere under my clothes, because I just couldn’t justify spending US $600+ on an Apple Watch. Lucky for me, hubby justified it in the name of my birthday! And as far as the fitness and activity tracking goes, I’ve been thrilled with it! The built-in Activity and Workout apps (they get “turned on” on your iPhone when you first pair your watch to it) offer all a desk-bound mom with no time to work out needs to get off her behind and start moving. They track your general activity (i.e. steps), how much you stand during the day, and your exercise (moving at a quicker pace/heartbeat then normal walking). And darn it, I WANT to get those little achievement awards! I’ve already lost 2 pounds in 2 weeks, just through the Watch prodding me to move a bit more. One of the other things I am really enjoying about the Watch is the customization. The Watch comes with 9 standard watch faces, but with most of those you have an infinite number of additional customizations you can make, and what’s great is you can save them as well. For example, for the Simple face, which, as its name implies, is pretty simple, I have several iterations saved that I can call up depending on what color outfit I’m wearing. I frequently wear Mickey Mouse on the weekends, and while we were recently experiencing a blue moon I was wearing the Astronomy face to track the moon’s phases. As a *girl,* I love being able to customize my watch to match what I’m wearing. Both in terms of the watch face but also in terms of the band, which is so simple and easy to remove and replace (just one small button on each end of the underside of the watch). 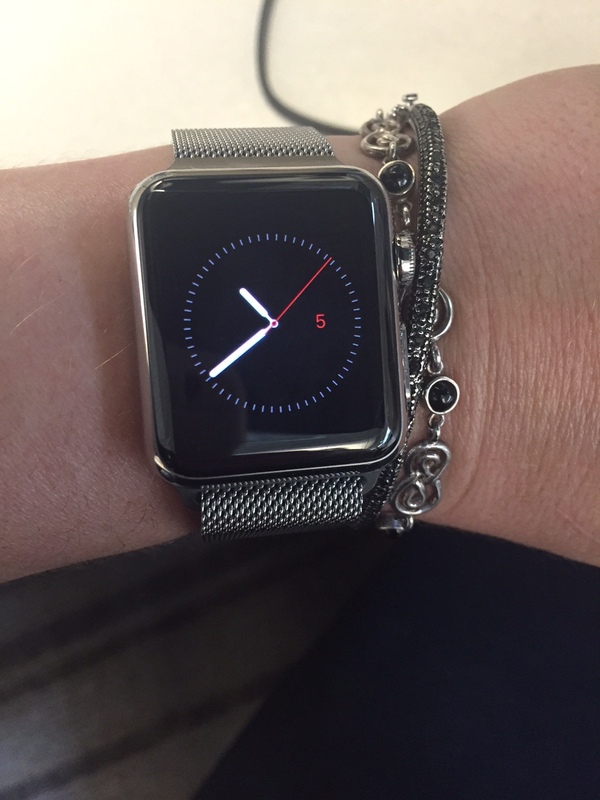 My Watch is the Stainless Steel with the Milanese Loop band. I’m so glad hubs chose that instead of the Sport watch, and let me tell you why. I’ve found great aftermarket Sport-type rubber bands for Watch that you would never know are not the real thing, but the third-party aftermarket Milanese loop or other stainless steel bands leave something to be desired. Apple has made much about the materials they’ve used with Watch, and they’re right. The quality of the leather and stainless Apple bands I’ve seen is really nice, but when I can get a Sport-like flurolastimer band for $4 that looks like the real thing (vs. $49 at Apple), I’m in. I’ve already purchased 2 colors of the MoKo band, and I may just get each one at that price! I’ve tried a few times to use Apple Pay on my iPhone and in all honesty, it’s just as clunky to pull out my phone from my purse and fiddle with Passbook as it is for me to pull out my wallet and fiddle with my debit card. Other than the security aspect, I haven’t found using Apple Pay on iPhone to be worth the trouble most of the time. On Watch, however, it’s a much more elegant, seamless and enjoyable experience. The credit cards on your iPhone passbook don’t sync with your Watch, so you do have to set them up separately. 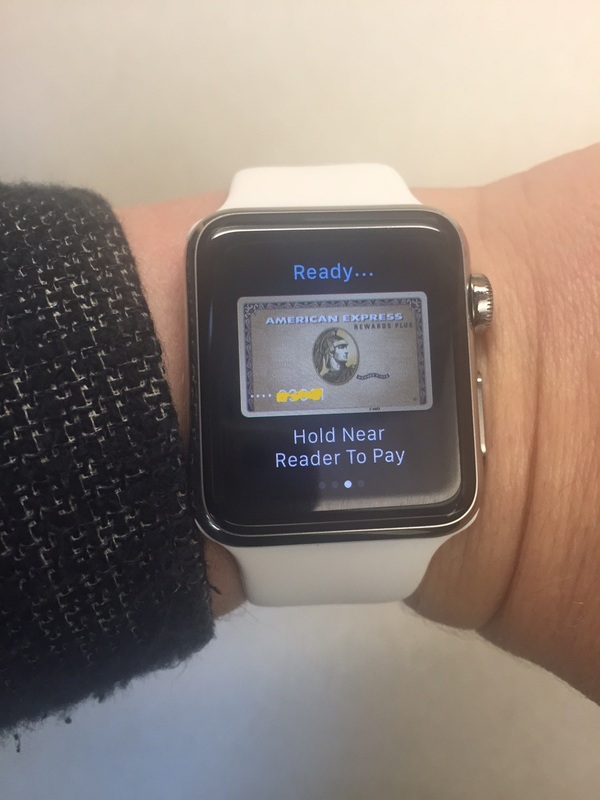 Once they are set up, though, using Apple Pay is as simple as tapping the button on the side of the Watch (the one below the digital crown), and gently holding your wrist above the card reader. That’s it. I’m actively LOOKING for places to use it now because it’s just so much simpler and easier that digging in the black hole that’s my purse for my phone OR wallet. One of the most surprising aspects in using the Watch, however, is how it’s actually allowing me to put my phone DOWN for a change. I’ve set up my Notifications so that I’m only getting the gentle wrist tap and *ping* for VIP emails and certain text messages, and as a result, I find I don’t need to constantly look at my phone anymore. I can leave it in my purse or on my desk, and know that if it’s important, Watch will tell me. Another unintended benefit is that I almost never can hear my phone ring when it’s in my purse, but Watch taps me to let me know when a call is coming in, and with a quick glance at my wrist (rather than fishing through my ever-expanding bag) I can see if it’s something I need to answer right away or can let go to voicemail. As a result, I can relax more, knowing that Watch will let me know when I need to pay attention to my phone, rather than feeling like I have to constantly check and recheck it just to make sure I didn’t miss anything. In the end, adding this subtle, wearable tech has allowed me to let go of more intrusive tech. And this is really the most important benefit of Apple Watch, but it’s also one that is hard to explain. It is really transformative once you experience it. One of the most thoughtful reviews on this that I’ve seen is Ben Bajarin’s My First Week with the Apple Watch on Techpinions. He really nails the experience with Notifications that I’ve had as well, just in a much more eloquent and tech-savvy way. Thinking about the Watch, or not? Let me know in the comments below! Chanel Le Vernis Secret 625 is part of Chanel’s Fall 2014 Collection Etats Poetique, along with Chanel Le Vernis Orage 631, a gorgeous dusty grey black creme and Chanel Le Vernis Atmosphere 629, an intriguing pinkish purple pearlescent topper. They make for a solid nail color collection, that many, on first glance, would say is rather boring. But with Chanel, all is not usually as it seems at first glance. I always like to have a few “go-to” nudes at my fingertips, no pun intended, for when I’m looking to wear something unobtrusive and low-maintenance. So I was glad to see another neutral option in Secret. But what surprised me, was how BEAUTIFUL Secret actually is on the nail. It’s an immensely flattering color, so it’s more than just unobtrusive, it’s actively beautiful. And it is apparently flattering on many different skin tones, as Sabrina from TheBeautyLookBook.com demonstrated with her swatches as well. And the formula. I’ve already waxed rhapsodic about how Chanel KILLS the formula with their pale, sheer colors, such as Ballerina, Frenzy and Frisson. Unlike my multitude of experiences failures with the paler shades available through Essie or OPI, Le Vernis Secret 625 didn’t even streak with the first coat! Flowed beautifully, no streaks or pulling. This photo is with 2 coats. Do I even need to say how office appropriate this is? But it’s equally appropriate with cocktails and a LBD, or frankly, in any situation. I even think it will look beautiful as a pedicure. 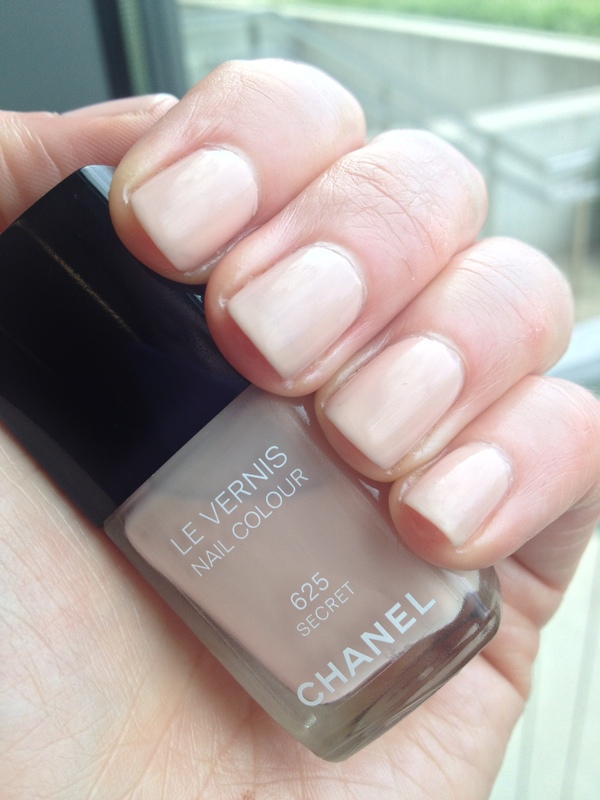 Chanel Le Vernis Secret 625 is US $27 and is available on Chanel.com and at Chanel counters worldwide. Call me one of the unlucky ones (okay, you’re unlucky). While some people can use any old base coat and top coat and have their manicures last 5-days plus, I’m one of those poor souls where it’s a GOOD day if I’m on day 2 of a manicure without chips or serious tipwear. I actually have a spreadsheet (a SPREADSHEET!) where I track the results of my base coat/top coat combination experiments. I have even color-coded the results (i.e. number of days before first chip) as red (1 day or less), yellow (1.5-2.5 days) and green (> 2.5 days). Very, very few greens on that sheet and lots and lots of yellow and red. I do all the prep work that you’re supposed to, and I moisturize like crazy, and yada yada. Still, chiptastic after a day or 2. I have done Shellac gel manicures in the past, and I am never again going to get on that application/removal roller coaster and the damage that can cause to your nails. Soaking them in pure acetone for 10+ minutes isn’t helping nail health, that’s for sure. Lucky for me there are several new products on the market that have separated me from my hard earned cash and are dangling in front of me the promised land of week-long manicures. The first one up for review is Deborah Lippmann’s Gel Lab. 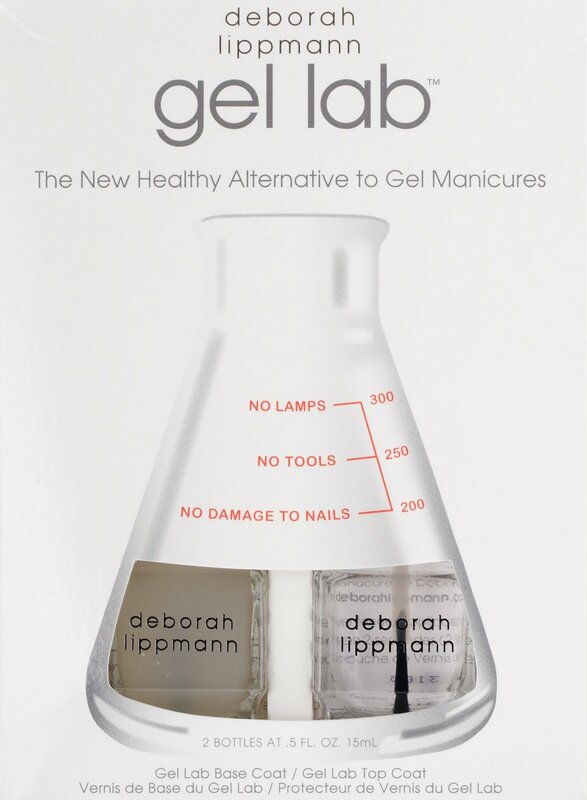 Promoted to give “gel like results” and “5+ days of wear” without the issues of gel manicure removal, I was excited to try Deborah Lippmann’s Gel Lab, even though it had a US $45 price tag. In order to make the test as “scientific” as possible (she said half-jokingly), I prepped my nails as I always do, and used a polish color that I’ve used before and had no issues with (Chanel Le Vernis Vertigo). I specifically chose a dark color so chips and tipwear would show right away. And unfortunately, show right away they did. I had minor tipwear in about a half a day, and the first serious tipwear within a day. Chips started a’comin’ on day 2, and by the end of the second day, I ended up having to do a quick tip repair and repaint of the top coat as I didn’t have time to redo my whole mani. Less than a half day after the repair, the thumb started chipping again. In addition, application was not pleasant. The base coat is very goopy, and made my color look a little lumpy. The top coat didn’t help much either. It’s about as thick as Seche Vite but without the self-leveling and shine you get with that best-in-class top coat. In all, it was an epic, epic fail, and this set will be returned. Next up, CND Vinylux. Maybe lady luck will cut me some slack. I’ve never met a red Chanel nail polish that I didn’t like (or a vamp, or black, for that matter). 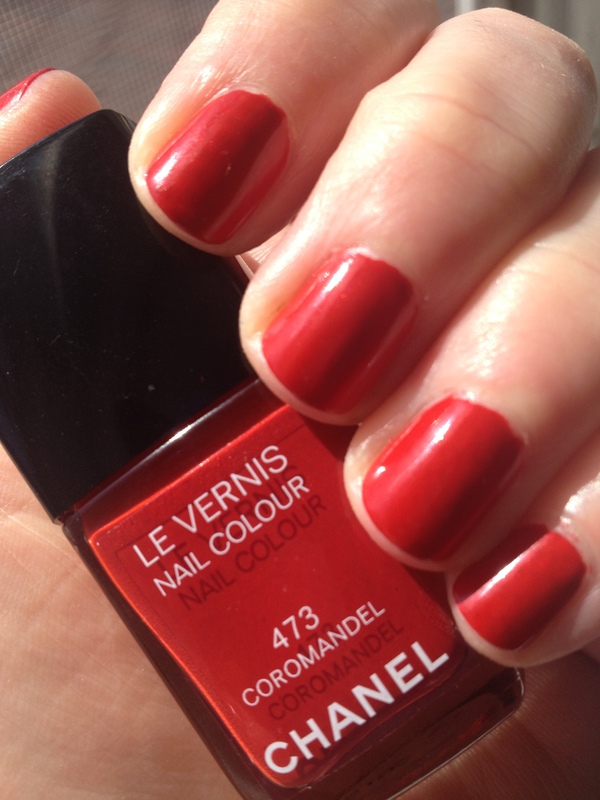 Chanel Le Vernis Coromandel 473, introduced as part of the Rouge Allure Laque collection in 2009, along with Dragon 475, Imperial 469 and Ming 471, is another Chanel red that I love. It’s a true red, with a slightly warm, orangey back note to the color, but it certainly does not stray into coral territory. It’s really only noticeable in comparison with cooler, blue-based reds. It’s a very wearable color, done in the beautiful way that Chanel does. It’s a classic creme formula, no shimmers or glimmers, hidden or otherwise, that applied flawlessly in two coats. And even though I now have probably at least a half dozen or more Chanel reds, and another half dozen of OPI reds, I would never, ever give this one up. Chanel Le Vernis Coromandel 473 is a limited edition color that is still available on Chanel.com for US $27 and at Chanel counters. But you know how Chanel LEs are – if you want it, and you should, pick it up while you still can! I am not a big fan of green nail polish. And yes I have the obligatory Peridot, because no self-respecting Chanel collector would be without it, but it’s not like I reach for it with any regularity. But Chanel Le Vernis Mysterious 601, introduced as part of the Fall 2013 Superstition de Chanel collection along with Alchemie 591, a beautiful mid-toned green metallic, and Elixir 589, a gorgeous dusty mid-toned pink, is a green nail polish I can truly love. Mysterious 601 is a dark – super dark (nearly black) – olive green creme. It’s so dark it operates as a neutral, which of course, I love. The green acts more as an undertone than as a “look at me I’m wearing green nail polish” kind of color, which in certain conservative environments (I’m looking at you, office of mine) can freak some people out. The formula was perfect – great, in fact, my notes read. This is two coats (one thin, one slightly thicker) over Revlon Colorstay Gel Coat Base Coat and Dior Gel Coat Top Coat. 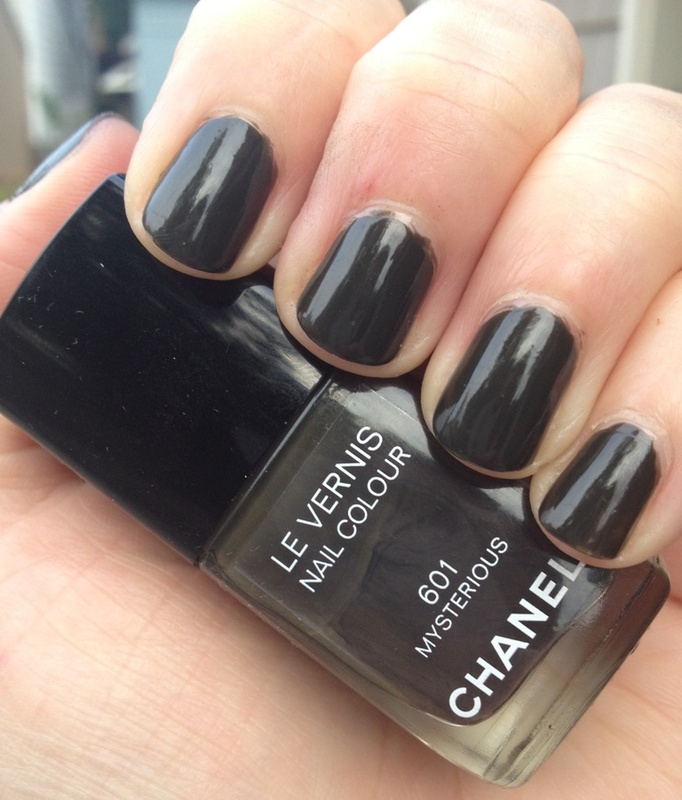 Chanel Le Vernis Mysterious 601 is available at Chanel counters and on Chanel.com for US $27. If you love dark neutrals, be sure to pick this one up before they’re gone.